Who sits on the Iron throne at the start of Season 1? How well do you know your Game of Thrones Trivia? Like thousands (maybe millions) of people around the world, we're hopelessly addicted to QuizUp on iPhone and iPad. It's without question one of the greatest trivia games not just on mobile, but all of gaming. There are so many categories. Including the popular fantasy drama television series Game of Thrones. If you're having trouble, here are a small sampling of questions and solutions we've come across. Who has three sons with Stannis Baratheon, all stillborn? Who tells Shae about the day Sansa was born, when all the bells in Winterfell rung in celebration? Who does Stannis Baratheon plan to make his Hand of the King once he takes the Iron Throne? Jon Snow tells the wildlings how many of the 19 castles along the south side of the Wall are currently manned? Why does Theon Greyjoy execute Ser Rodrik Cassel in Season 2? Who sits on the Iron Throne at the start if Season 1? What kind of wolves protect the Stark children? What is the name of Theon Greyjoy's sister? Walder Frey is the lord of what? Who has an abundance of grass and horses? 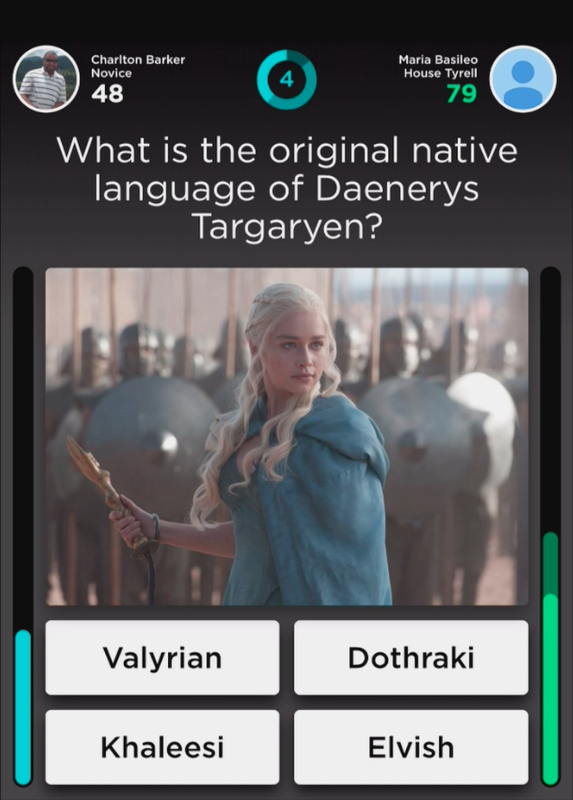 What is the original native language of Daenerys Targaryen? Who turns Gendry over to Melisandre? Who confides to Littlefinger that she doesn't want to be a queen; she wants to be the queen? Which character manages to kill a White Walker in Season 3? Who beheads Rickard Karstark with a single strike with his sword? Eddard Starks weapon (Ice) is what kind of weapon? Lord Eddard Stark is married to whom? According to Jon Snow and Arya Stark what is the first lesson in sword fighting? Stannis is defeated at Blackwater and becomes withdrawn, allowing only whom to see him? Who raises an army in the North in order to free the captured Lord Eddard Stark? Who marries his daughters, and they give him more daughters, and on and on it goes...? Which of the following members of the Small Council was secretly giving information to Queen Cersei? What did Sam find North of the Wall and use to slay a White Walker? What disease has Shireen Baratheon got? A wight can only be killed by what? Who said "Three victories don't make you a conqueror"?